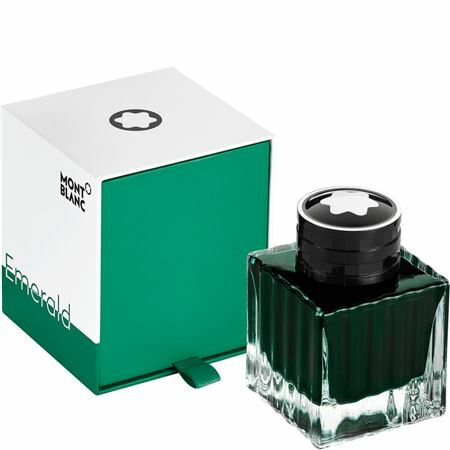 Order your Montblanc Bottle Ink 50ML - Emerald Green today from FahrneysPens.com. Fine Pens, Refills & Luxurious Gifts – great prices & fast shipping. By introducing the new Emerald Green color of the year collection, Montblanc strives to fulfill its dedication to writing culture and the pleasure of writing, bringing a fresh splash of color into the assortment each year with PIX, Fine Stationery and Writing Accessories. Emerald Green ink follows the line of promotional "Lucky Orange", "Pink" and "Golden Yellow" colors of the year. The fresh color, just in time for the summer of 2018, is inspired by the beauty of emerald stones.